Edvard Munch: Skrik (Ioruais: An Grá), 1893. Is é an eagla nó an sceimhle an mothúchán tréithrithe dian ba chúis leis an tuiscint atá rioscaí, ann nó nach bhfuil i láthair, sa todhchaí nó atá caite. An eagla is féidir a mhíniú freisin mar mhór-aireachtáil ar an staid, coinníoll, saincheisteanna, na daoine, agus a leithéidí, i bhfocail eile eagla ar an dorchadas. An eagla a athraíonn go mór ó dhuine go duine, agus is féidir a leathnú idir éadrom mothú de corraí mhór agus eagla, ar a dtugtar paranóia, uafáis, nó fóibe. Ar mothúchán go bhfuil bhraith de ghnáth i láthair nó i an t-ionchas contúirte, nó a bhagairt. I bhfocail eile, is é an eagla thoradh ar an anailís guaise agus ceadaíonn an t-ábhar a teitheadh nó ag troid, chomh maith leis sin ar a dtugtar faoi an téarma " troid nó eitilt ". Tá sé ina mothúcháin bunscoile a eascraíonn as an nádúrtha col chun an riosca nó ar bhagairt, agus é a léiriú i ngach ainmhithe, lena n-áirítear an duine. Dar leis na suirbhéanna an ceann is coitianta imní san áireamh : an thaibhsí, na Farraige, go bhfuil na cumhachtaí olc, ciaróg dhubh, damháin alla, nathracha, airde, uisce, spásanna teoranta, tolláin agus droichid, snáthaidí, anostracism, teip, stoirmeacha toirní, rátálacha, léirmheasanna, óráidí poiblí agus cuimhní cinn ar chogadh. Sa tástáil nuálaí i an eagla na daoine aonair, Bille Tancer anailís ar na cineálacha eagla, lena n-áirítear an abairt " eagla na... ". An eagla is minice a luaitear tá : an eitilte, ar an méid, an fir ghrinn, dlúithe, bás, diúltú, daoine, nathracha, rath, dúnmharú, agus ag tiomáint. Bitheolaíoch labhairt, eagla go bhfuil a instinct marthanais gur féidir ainmhithe a sheachaint cásanna contúirteacha ar a son féin nó le haghaidh a sliocht. An réad is mó de eagla ar a ainmhí a bhfuil de ghnáth an láithreacht de creachadóir. Is é an chastacht an aigne an duine, áfach, thrasuí seo, emotion agus a stiúradh i dtreo rudaí agus cásanna chomh héagsúil le gníomhaíochtaí an duine. Tá cuid de na fóibe atá dócha a bheith éabhlóideach tionscnaimh domhain, go háirithe ar eagla na nathracha agus damháin alla. Tá sé léirithe go bhfuil eagla den sórt sin i eagla uilíoch carachtar. Eile tá eagla a bhaineann le gníomhaíochtaí sóisialta is déanaí agus ar leith ach amháin chun sochaithe nua-aimseartha an iarthair. Is féidir linn, dá bhrí sin, le réasún glacadh leis go bhfuil siad a thionscnamh bitheolaíoch. Ó thaobh na síceolaíochta tá eagla próiseas mhothúchánach. I an teoiric de difreálach mothúcháin ag imní. 'D eagla a bhaineann le mothúcháin bunúsacha, is é sin, inbheirthe mhothúchánach próiseasle géiniteach réamhshocraithe fiseolaíocha a chomhdhéanann í, áirithe facial léiriú agus go háirithe suibiachtúla taithí. Cúiseanna eagla smaoineamh ar réadach nó samhailfhadú mbaol. Eagla slóg an orgánaigh a chur chun feidhme seachaint iompar, éalaitheach. An láithreacht de eagla i ealaín uileláithreach. Mar sin, is ionann é scéal seánra féin (scary gearrscéalta, úrscéalta de terror) saothraithe go forleathan, go háirithe ó tá an Naoú haois déag le haghaidh údair spreagthach rómánsúil mar Edgar Allan Poe, Howard Phillips Lovecraft, nó fiú Gustavo Adolfo Bécquer. An litríocht tá a ghintear ar leith le carachtar a léiriú ar an uafáis agus eagla, mar shampla Dracula ag Bram Stoker nó an ollphéist Frankenstein ag Mary Shelley. Tá sé chomh maith le seánra scannán (an scannán uafáis). An dealbh iarthar, go háirithe na meánaoise léirmhínithe ar an Apacailipsis, tá an ardaithe ar an eagla go dtí an gcatagóir na healaíne. An phéintéireacht, go háirithe comhaimseartha, tá a léirítear ar an dobrón de an duine nua-aimseartha. 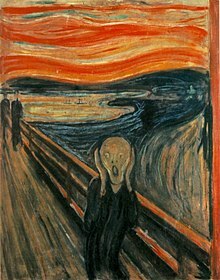 Sampla cáiliúil is ea an péintéir ar expressionist Edvard Munch ina íocónach bosca, An caoin, cé go léiríonn na samplaí a d ' fhéadfadh a bheith méadaithe ag beagnach gach uair, mar atá i gcás an Bosco, Brueghel, nó na n-oibreacha de Piranesi. Tá imní mór gabháil go minic ag comharthaí fisiciúla cosúil le ráta méadaithe croí agus brú fola, rith croí, meadhrán, béal tirim, pian cófra, nausea, giorra an anáil agus a chuireann. D'fhéadfadh a bheith ann freisin ina craiceann geal, allas, mhéadaigh táirgeadh aidréanailín san fhuil, agus tinneas bhéal an ghoile. Síceolaíoch, tá imní a bhaineann le tuiscint vague de bhagairt nó contúirt. Uaireanta is féidir imní a bheith ina siomtóim de strus. Na comharthaí fisiciúla de imní Feictear mar bhealach ina ullmhaíonn an comhlacht le haghaidh bhagairt seachtrach. Féadfar Imní bheith bainteach freisin le dúlagar. Féadfar Imní a léiriú freisin i téarmaí gnúise. De réir sainmhíniú, tá bás an cuspóir feabhais eagla par, mar an cruthanta an baol céanna. Ach is é an eagla i bhfad ó uilíoch. Mar sin féin, tá sé an dá an ceann is coitianta agus is aisteach. Líon cultúr níos faide ná an eagla an bháis ag dul i muinín an creideamh na beatha tar éis bháis. Is é an smaoineamh bunúsach i go leor reiligiúin, lena aigne apprehends bás gan eagla, ach eagla cad a leanas é, sé sin le rá an breithiúnas nó ifreann. fealsúnachtaí aindiacha agus ábharaíoch, ón nGréig ársa agus fós an-tionchar lá atá inniu ann, aird a tharraingt ar an ghné aisteach de an eagla an bháis. Eagla mar mothúchán bunúsach an duine, comharthaíocht ar staid contúirte ar go leor cúiseanna seachtracha agus inmheánacha, ó bhroinn nó a fuarthas. Cognaíocha a ceapadh cúiseanna eagla: uaigneas, diúltú, dúlagar, bagairtí ar fhéin-mheas, tuiscint ar teip déanamh, tuiscint ar neamhdhóthanacht. Na héifeachtaí ar eagla: an staid mhothúchánach éiginnteacht, teannas láidir néaróg, a spreagadh an duine chun éalú, a aimsiú a chosaint, slánú. Is iad príomhfheidhmeanna na eagla agus a stáit mhothúchánach comhghafach: rabhadh, cosanta, inoiriúnaithe, cuardaigh. Tugadh an leathanach seo cothrom le dáta an 17 Márta 2018 ag 19:00.